I purchased this as part of a fish dinner last night. Read to find out what I thought of it. 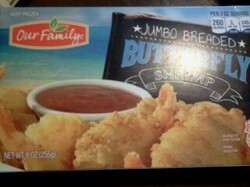 Product Description: Frozen breaded butterfly shrimp from the Our Family brand that. I purchased a box of this shrimp at one of our local grocery stores yesterday morning for $6.29 and, after baking the shrimp in our conventional oven, served it as part of a Tuesday-night family fish dinner last night. It had been awhile since I made fish for dinner and, knowing it was something all of us would enjoy (including my two picky children), I decided to stop at one of our local grocery stores before work and pick some up. As part of this, I realized I was in the mood for shrimp and, when I got to the frozen fish section, I looked for that as well. The store is in the middle of a major remodel and I was disappointed to discover their selection of fish had shrunk (hopefully temporarily). This was especially true of the shrimp and, after some consideration, I ended up picking out a box of Our Family Butterfly Shrimp. I will admit, I did hesitate when it came to making this purchase. While the Our Family brand was definitely the cheapest (the main reason I picked it), I don't consider $6.29 for a small box overly affordable either. In fact, the only reason I even made this purchase was I really was in the mood for shrimp and didn't have the time to drive around town looking for a better price. Fortunately, the shrimp proved to be somewhat decent. One thing I found I liked about this brand when I purchased it (and was something that was taken into consideration when compared to the other brands) was the fact I could make it in the oven. Many other brands of shrimp require you to fry them and, while I'm not necessarily opposed to that, I do prefer baking simply because it's less messy. The breaded shrimp did also bake up well in the oven which, again, isn't always the case. The breading came out crispy and brown rather than soggy, like so many other brands (including some that are much more expensive). As far as taste goes, I also had no complaints. The breading had a decent blend of seasonings in it and there was quite a bit of shrimp under it (I've purchased some other brands that were almost all breading). So, while I'm still not completely sure it was worth the money I spent on it, I didn't feel like I got a low-quality item. I still think $6.29 was too much for this product and probably would not purchase it at that price again. However, as far as the overall quality goes, I did think this brand was better than most and, at least if you can find it at a reasonable price, I would recommend it based on that. My wife purchased this from Schwan's home delivery service. Was it worth the money?